TODAY: The contract is now official. It’s for $15.5MM, reports Jon Heyman of FanRag Sports (Twitter links), with a $1.5MM signing bonus and consecutive salaries of $8MM and $6MM. YESTERDAY, 1:49pm: The sides are working to finalize a two-year pact for something approaching $8MM annually, per ESPN.com’s Jerry Crasnick (Twitter links). That’s right around the contract value that MLBTR suggested entering the winter. 11:19am: The Brewers are closing in on a contract with free agent righty Jhoulys Chacin, according to Ken Rosenthal of The Athletic (via Twitter). Terms of the prospective deal are not known at this time. Chacin is a client of the Legacy Agency. Chacin, 30 next month, is fresh off one of the best seasons of his career, having notched a 3.89 ERA with 7.6 K/9, 3.6 BB/9 and a 49.1 percent ground-ball rate over the life of 180 1/3 innings with the Padres, who signed him to a modest one-year commitment last offseason. Chacin’s strong output in 2017 positions him to handily top the $1.75MM guarantee he received in San Diego last winter. He’d join a Brewers rotation that will be without top starter Jimmy Nelson for a yet-undetermined portion of the 2018 campaign following September shoulder surgery. Assuming the deal is ultimately completed, Chacin will join Chase Anderson and Zach Davies in the Milwaukee rotation, with Josh Hader, Brent Suter, Brandon Woodruff and Junior Guerra among the other candidates vying for opportunities to start. Chacin may not bring significant upside to the table, but he’s been a durable mid-rotation arm over the past two seasons and should help to stabilize a group that carried significant questions about the number of innings it could be reasonably expected to provide to manager Craig Counsell. Chacin’s solid 2017 season did produce its fair share of skeptics — most notably owing to his significant home/road splits. In 100 1/3 innings at the pitcher-friendly Petco Park, Chacin logged a sensational 1.79 ERA, but that number spiked to a ghastly 6.59 in 80 road innings. Chacin also dominated right-handed hitters to the tune of a .213/.284/.318 opponents’ slash line, while lefties posted a much more adept .251/.356/.433 slash against him. The move to a more hitter-friendly Miller Park, then, will undoubtedly raise some questions. However, Chacin enjoyed success earlier in his career in the game’s worst pitching environment, Coors Field, and he’s long limited home runs better than the average pitcher. Despite spending parts of six seasons in Colorado and despite the recent uptick in homers throughout the league, Chacin has averaged just 0.85 HR/9 as a big leaguer. Newer metrics paint Chacin in a favorable light, as well; Statcast pegs Chacin’s average exit velocity on balls in the air (91.3 mph) and overall exit velocity (85.4 mph) among the weakest in the game for qualified pitchers. His .303 xwOBA, while not elite, places him alongside names like Danny Duffy, Jake Arrieta and Madison Bumgarner. That’s not to say, of course, that Chacin should be expected to produce at comparable levels to those three starters, but rather that his solid results and overall penchant for weak contact could be more conducive to success than his surface-level home/road splits would suggest. The Rangers talked to the Pirates about acquiring right-hander Gerrit Cole, but those discussions didn’t go anywhere, TR Sullivan of MLB.com reports (Twitter link). Given that the Rangers are in need of starters even after signing Doug Fister and Mike Minor, the possibility of them turning back to old friend and top free agent Yu Darvish has come up. General manager Jon Daniels revealed Monday that the Rangers and Darvish still have a strong relationship even after they traded him away last July, Jeff Wilson of the Star-Telegram tweets. For his part, Darvish is interested in a reunion, agent Joel Wolfe told Wilson and other reporters (Twitter link). The potential of Texas deploying a six-man rotation doesn’t necessarily appeal to Darvish, though, despite the fact that he spoke in favor of that setup on multiple occasions in the past. “He’s one of those guys that would rather pitch on short rest than long rest,” Wolfe said. The reigning World Series champion Astros at least made an effort to acquire 2017 NL MVP Giancarlo Stanton from the Marlins, according to Jon Heyman of FanRag (Twitter link). The two sides never came close to a deal before the Yankees landed Stanton, however, Heyman adds. Notably, the Astros were one of four teams to whom Stanton would’ve accepted a trade. He also would’ve added another terrifying force to an all-world lineup headed by AL MVP Jose Altuve and Carlos Correa. Meanwhile, the Giants would’ve had Stanton had he been willing to waive his no-trade clause for them. Executive vice president of baseball operations Brian Sabean addressed his team’s failed pursuit Monday, saying his only “angst” stems from his belief that Wolfe didn’t make it clear that the Giants and Cardinals were just fallback options for Stanton (Twitter link via Andrew Baggarly of the Mercury News). While the Giants were prepared to take on $230MM of Stanton’s $295MM contract to acquire him, that doesn’t mean they’re going to go into free-spending mode now that he’s out of the mix. Rather, they’re “back to being payroll conscious,” Heyman tweets. Sabean also spoke on the subject of free agency and indicated that the Giants aren’t going to sign any players who rejected qualifying offers earlier this offseason. That could rule them out for rumored targets such as center fielder Lorenzo Cain and third baseman Mike Moustakas. Signing either of those players would cost the Giants not only money, but their second- and fifth-highest draft picks in 2018 and $1MM in international bonus pool money. “If you’re asking me personally, my vote would be a no, being that we wouldn’t want to get involved with somebody like that,” said Sabean, who highlighted the importance of having the second pick in every round of the next draft. GM Bobby Evans shares similar feelings, according to Alex Pavlovic of NBC Sports Bay Area. While the Giants seem set to use those picks, they’re listening to offers for the No. 2 selection in this Thursday’s Rule 5 draft, Henry Schulman of the San Francisco Chronicle tweets. The Padres “remain in constant communication” with free agent righty Jhoulys Chacin’s camp, GM A.J. Preller revealed (Twitter link via AJ Cassavell of MLB.com). A deal is not imminent, though, Cassavell adds. Chacin turned in a quality year with the Padres last season and should earn a nice contract as a result. Athletics executive VP Billy Beane announced after the season that they’re hoping to sign some of their best young talent to contract extensions this offseason. That remains the case, Beane told reporters. Beane added that picking up a veteran starter is a low priority for the A’s, saying they’re “not overly impressed with guys that would be available to us” (Twitter links via Susan Slusser of the San Francisco Chronicle and Jane Lee of MLB.com). Working against the Giants is a payroll that is already dangerously close to the luxury tax barrier and that Martinez doesn’t help the Giants’ stated goals of improving the outfield defense or getting better in center field. The Padres are interested in reunions with right-handers Jhoulys Chacin and Craig Stammen, general manager A.J. Preller told reporters at this week’s GM Meetings (link via MLB.com’s AJ Cassavell). “From our standpoint, it’s about seeing how the next couple weeks play out,” said Preller. “They’re two guys we have interest in bringing back. We’ve got to see if we line up financially.” Cassavell reports that the Friars would consider a multi-year deal for either pitcher, though such a contract would likely need to come with a discounted second year. San Diego has a number of arms rising through the system and may not relish the idea of blocking those arms, though from my vantage point having either Chacin or Stammen around at an affordable rate is a good problem to have if all parties are performing well. In a separate pair of Padres columns, Cassavell characterizes their interest in Eric Hosmer as little more than due diligence, while Dennis Lin of the San Diego Union-Tribune hears a bit differently and reports that their interest goes “beyond the cursory level.” Cassavell notes that the Padres have kicked the tires on roughly 50 free agents thus far (most of them pitchers) as they look to get a full picture of the free-agent market. Lin, meanwhile, suggests that the Padres may be intrigued both by Hosmer’s intangible leadership qualities and by his 25-homer output despite being an extreme ground-ball hitter. A willingness to amend that approach and put the ball in the air more often could yield untapped power; I’d imagine that the Padres, who call spacious Petco Park their home, are also intrigued by the pop that Hosmer showed in his own cavernous home park (Kauffman Stadium) in spite of an approach that isn’t traditionally conducive to power. The D-backs have added Jason Parks to their front office as their new director of pro scouting, Nick Piecoro of the Arizona Republic reports (via Twitter). Parks, who many readers may remember from his excellent work at Baseball Prospectus, has been with the Cubs as a scout and a special assistant since 2014. He’ll join an increasingly youthful Arizona front office that is led by GM Mike Hazen and assistant GMs Jared Porter and Amiel Sawadaye. Notably, Parks’ role as director of pro scouting will be the same one that Porter filled with the Cubs when he and Parks were colleagues in Chicago. 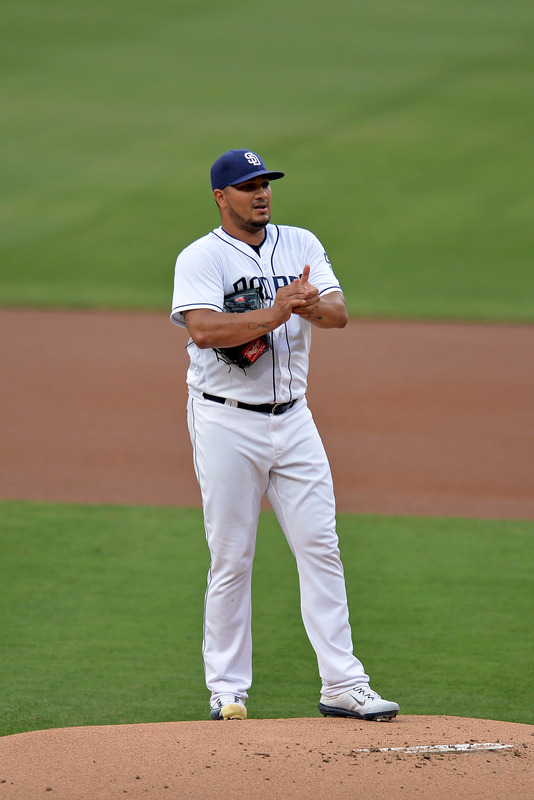 Padres right-hander Jhoulys Chacin threw 180 1/3 innings of 3.89 ERA ball and contributed upward of two wins above replacement this season, making him one of the top bargain signings of 2017. Chacin inked a $1.75MM deal with the Padres last winter and should fare much better on his next contract, one that might come from another organization. But Chacin told AJ Cassavell of MLB.com and other reporters Saturday that he’d be willing to continue his career in San Diego (Twitter link). “It’s hard to tell,” Chacin said of his future. “But I would be really happy to come back here.” Re-signing the capable innings eater would make a lot of sense for the rebuilding, starter-needy Padres, as MLBTR’s Jason Martinez wrote Friday. Padres owner Ron Fowler informed Dennis Lin of the San Diego Union-Tribune that there are “a couple people we’re fairly close to getting deals done with,” which could mean Chacin or any of their other impending free agents. Regardless, both Fowler and managing partner Ron Seidler suggested to Lin that they’re happy with how this year has gone for the club. Seidler has seen enough progress to believe the Padres could soon be a factor in the NL West, a division the big-spending Dodgers have ruled over the past half-decade. Looking ahead two years, Seidler said: “At minimum, if we’re not in the chase for (the playoffs), I’d be disappointed. (If not), it wouldn’t mean I’d be angry or upset or anything. I think, given where we are right now, in 2019 we should have every chance not to just be a playoff team but to win the division.” Check out Lin’s full piece for more quotes from Seidler and Fowler on the direction of the franchise. By starting in his final three appearances of the year, Angels righty Bud Norris lost out on a $500K bonus, per Jeff Fletcher of the Orange County Register. Norris would have collected that money had he made 60 relief appearances (he finished with 57), but starting him was not a money-saving move by the Angels. Rather, Norris volunteered to switch roles down the stretch, his representative revealed. “He did it for the team,” agent Joel Wolfe told Fletcher. “Now he’s going into free agency as one of the most versatile and valuable pitching assets given the ways teams tactically use their pitching staffs. The value he’s gotten out of starting is far in excess of that performance bonus.” Norris joined the Angels on a minor league deal last January and proved to be a shrewd pickup, pitching to a 4.21 ERA and recording 10.74 K/9 against 3.92 BB/9 over 62 innings. Thanks to that production, he seems likely to land a major league contract during the upcoming offseason. Shin-Soo Choo has gotten some practice reps at first base this week and could end up as a part-time option there in 2018 for the Rangers, Jeff Wilson of the Fort Worth Star-Telegram writes. The Rangers are likely to cut ties with Mike Napoli after the season, which could open up first for Joey Gallo, but he’s probably better suited for the outfield, Wilson observes. Should Gallo take a spot in the grass, it might lead to some time at first for Choo, who has only served as an outfielder and a designated hitter since making his big league debut in 2005. Advanced defensive metrics have typically been bearish on Choo’s work in the field, though, and he’ll turn 36 next summer. First seems like a more logical place for him, then, though Wilson cautions that this experiment isn’t guaranteed to stretch into next season. Offensively, the lefty-swinging Choo has turned in another respectable year with 22 home runs, 12 stolen bases and a .261/.357/.423 line in 636 plate appearances. The Rockies offered Carlos Gonzalez a new four-year deal during extension talks last spring, USA Today’s Bob Nightengale reports. The two sides explored an extension for the long-time Colorado outfielder during the offseason, though talks never seemed to get too far — this four-year proposal is the only known offer exchanged, apart from some “initial suggestions” from Rockies management that were rejected out of hand by Gonzalez’s representatives in early December. Gonzalez said that he and the team hadn’t engaged in serious talks as of last February 22, and negotiations were reportedly “on hold” as of early March. The dollar value of the offer isn’t known (Nightengale describes it as “lucrative”), though the fact that Colorado was willing to offer four years to a player who will be 32 next Opening Day is in itself significant, especially since the Rockies have several other interesting outfielders on their big league roster and in the minors. The lack of an extension looms large for Gonzalez in the wake of his disappointing 2017 season — he has suffered through two DL stints and is batting a career-worst .228/.299/.345 over 365 plate appearances. 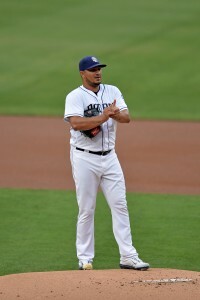 Jhoulys Chacin has expressed openness to re-signing with the Padres this winter, Dennis Lin of the San Diego Union-Tribune writes. Chacin has posted good results after signing a one-year, $1.75MM deal with the Padres last winter, and it isn’t surprising that the righty would like to stay at Petco Park — Chacin has a 1.86 ERA over 12 home starts (77.1 IP) this year, as opposed to a 7.35 ERA over 10 starts (49 IP) on the road. Those large splits were one reason, Lin notes, why the Padres may not have been able to move Chacin before the deadline, though Lin was surprised the team couldn’t have found at least one suitor willing to part with more than a token prospect. The Diamondbacks received some interest in minor league right-hander Jon Duplantier prior to the trade deadline, Fangraphs’ David Laurila reports. The 23-year-old Duplantier, a third-round pick for Arizona in the 2016 draft, has a 1.53 ERA, 10/1 K/9 and 4.25 K/BB rate over 106 combined innings at the high-A and A-ball levels this season. MLB.com ranks Duplantier as the second-best prospect in Arizona’s system, citing his “power curve,” solid changeup and fastball in the 91-96 mph range, though the righty has also already had some shoulder and elbow issues early in his career. A source with another club tells Laurila that the D’Backs put a high asking price on Duplantier in trade talks.